And here it is, Stephen Sondheim’s “Send in the Clowns” from his play A Little Night Music. Dedicated to the many clowns who keep popping up in the Old Dominion, like characters in a play by, say, Aristophanes. As (perhaps) Solomon reminds us in Ecclesiastes, there really isn’t anything new under the sun… especially not in politics, especially not in the game as it is played in our battered Commonwealth. Thomas Jefferson would be turning in his grave were it not for his own peccadilloes. This entry was posted in Humor, Insanity, News, PC/MC, Politics, Stupidity, USA, You can't make this [redacted] up by Dymphna. Bookmark the permalink. In reality only scandal of today worth looking at is Lt. 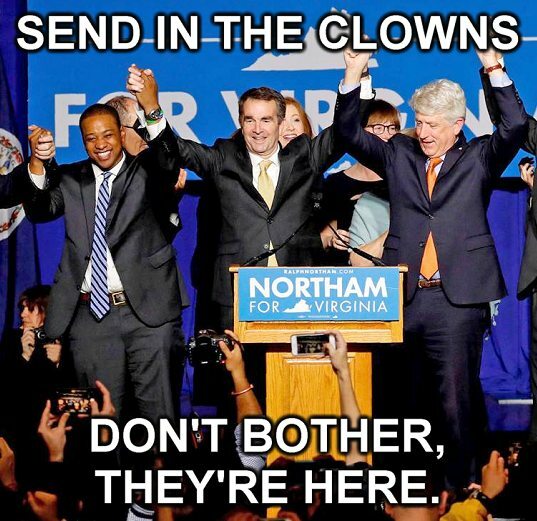 Governor Fairfax alleged attack on that woman( new Dem dogma teaches us that “ we have to trust the survivors “-see Kavanaugh confirmation) and Governors Northam call to kill newborn babies, as long mother and service provider agree(he at least doesn’t call that monster a doctor).Other stuff with black faces is just put simply their usual game of division of people in opposing groups so they could easier install full bore communism pardon “socialism” as original plan. Fact that their own soldiers fell in trap of their own zealotry and doing will not change that. They have a plan, and they are serious when they talk about it. People should listen the first time, but knowing my history somehow I don’t think they’ll listen. If they did, Democrat aka Communist party would be long dead and buried. At one point he does indeed call the monster a “doctor”. The fact that Northam himself is a pediatric neurologist makes his statements about abortion infinitely more appalling than they would be otherwise. One certainly has to wonder what happened to Hippocratic Oath. I guess Primum non nocere(Do not harm) is most certainly out of fashion for many “doctors”. Murder of the new born babies definitely doesn’t sound like that quite simple rule all doctors swear to before they start their practice. It’s sound more like something from stories of Herod and his actions in Bethlehem two millennia ago. That certainly caused outrage compared to quite relative silence of today. I guess it’s just sign of times we live in, where many blink on something like this or in many cases openly cheer for abortion even at late term of pregnancy and in the same time scream on top of their lungs about sanctity of life for “refugees”, in 90 % able and fit military aged men, without any second doubts. Many years ago the reciting of The Hippocratic Oath at graduation ceremonies of new medical graduates was dropped specifically because the Oath includes a statement that physicians will not procure abortions. The late conservative columnist, James Jackson Kilpatrick, long associated with National Review. He might have been expected to have opposed abortion without reservation. He did not do that. Instead, he spoke of an experience he had as a cub reporter when he visited a morgue in, I believe, Chicago. While there, he saw the corpse of a 17 year old girl, who had hemorrhaged to death after self-inducing an abortion. That image stayed with him for decades, possibly moderating his views. My wisdom fails me on the matter of abortion, and I am inclined to be suspicious of those who affect a general moral certainty on the matter. If we had a culture that supported mothers and fathers, it would go a long way toward dropping the rate of abortion here. While it abortion is sometimes the only way out, I don’t think it ought ever to be celebrated as some kind of “freedom”…back in college, my rather dour moral philosophy adviser insisted I do my senior thesis on abortion. I was whelmed. Impatiently, I told him I already knew the subject – which I was sure I did. So he calmly responded, “well, this will be easy then, won’t it”? and reminded me that he expected good primary source citations…That was a learning experience. Months later it resulted in a moment of metanoia, a paradigm shift. What I want to know nis whether the head of Virginia’s DMV is a Dem or Republican. I figure, he must be the next in line, right? Heh. The next in line after these three is the Speaker of the House, a conservative Republican. Our DMV is how I imagine dealing with Russian bureaucracy must be: grim and soul-draining. BTW, we noticed how much the set-up of our original federal government seems to have been based on the Virginia model. Of course, many of the authors of our Declaration of Independence and our Constitution were Virginia-born. They were deists and for the most part, admirers of the (Scots-version) Enlightenment. In the 2016 animated film “Zootropolis”, the DMV staff are sloths, who move v..e..r..y s..l..o..w..l..y. The Office of Circumlocution, as Dickens may say. Northam wore a sheet one day, two eyeholes cut for sight. He claimed he wasn’t under it – the truth has taken flight. for Northam likes your babies, but to live they have no right. Were Michael Jackson still alive would he be condemned for White Cultural Appropriation?